So, technically, the KAL for Luvinthemommyhood ended yesterday. I had pretty ambitious goals for it, and here's where I am on my goals. Goal #1: Big Blue Sweater for Little Man: Finished. This one was the first sweater I wanted to make for my Little Man; and it turned out nicely. It was actually easy, considering I was basically winging it. I took some measurements, looked at a chart, followed a formula, and voila! a sweater for him. I still have to add the stars to make it like the Coraline sweater, but all the knitting is done. Goal #2: Finish Playful Stripes: Not Finished. This one I had hoped would be easy enough - all I had was the yoke and button bands, seaming and finishing. Then, when I went to put it together, it wasn't all I had hoped it would be. I do plan on getting this finished before too much longer, if for no other reason than to wrap my Princess in some love. Lesson #1: Sometimes it's not you, it's the pattern. No, really, no matter how hard I tried to make Pink work for me, it just wasn't. So, I abandoned the pattern. It's not that it was a bad pattern, but it didn't work for me. It's like that one teacher in school that's a great teacher, but when you're in their class, everything is turned upside down and you would understand the lessons more if they were taught in Farsi than in English. We've all had those teachers - really great, but the teaching style doesn't suit us. Same thing here. Lesson #2: It really does help to wash and dry your swatches. It gives you a real sense of what the fabric will be like, and if you're going to go through all the trouble of making a gauge swatch to begin with, and also if you're going to go through all the trouble of making a sweater, you want it to fit. Do it right. Lesson #3: Pay attention to your pattern. It sounds like it's a no-brainer, but the directions are usually very specific, and you need to read them very carefully. Small words mean a lot: more, for example. When a designer tells you to follow the directions 8 more times, it means 9 times total. Don't just jump to conclusions. Read carefully and thoroughly. Several times. You may miss something. Lesson #4: Find a pattern that teaches you new techniques. I learned a couple on this sweater, like a tubular cast-on, and how to cable without a cable needle. These are things I might never have learned on my own, but this sweater taught me those things, and I am a better knitter for it. Lesson #5: Trust your instincts. I think sometimes I rely too heavily on this pattern, but I say this for myself in the area of something's wrong. Throughout this sweater, I sometimes followed blindly (and incorrectly) the pattern, and I should have gone off to a quiet secluded place and double checked myself. Instead, I forged ahead, and created some issues, that now I have to fix. I missed a couple of decreases for the waist shaping, and in doing so, threw off the yoke. So, I had to rip back, like 2 skeins worth of knitting. It was slightly painful, but in order to have the sweater right, and fit, I need to fix it. I also tried to get out of not adding more rows in the waist section, but when I got to try on the sweater, it wasn't as long as I want it to be. We're talking about 4-6 inches too short. I should have trusted my gut and added the rows. But I was worried about yarn. If I have to, I can go get another skein. Although it will be a different dye lot, it's another new skill I can add - mixing dye lots. Lesson #7: There are some amazing knitters out there. When you start searching on sweater patterns, start looking at finished projects. Some people keep meticulous notes on their projects, and you can really learn a lot about a pattern or designer, by reading the notes or comments on a pattern. You can also see if people have modified the pattern - like adding sleeves, or taking them out, scaling the pattern up or down, changing the button bands, etc. Not only that, but I met some incredibly wonderful knitters through this knit-a-long. These women are incredible, competent, fast, inspiring, warm, and just all around fantastic. They freely share advice, help, encouragement, love, hugs, and terrific recipes. :) I feel that I have grown as a knitter (and cook) by knowing these lovely ladies. Their advice and support were incredibly helpful and I don't know if I could have made it through without them. They gently pushed me through, and I finished. There were times when I wanted to quit, thinking there was no way I'd make any sweater in the time given. But I did. This KAL taught me a lot more than I would have learned on my own. So, to all the Summer Sweater Knit-A-Long, thanks. You are wonderful, bright, and amazing. I am better for knowing you. 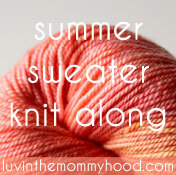 Love your thoughtful post about knitting sweaters. Everything you wrote applies to knitting in general and your lessons learned remind me of my wish to be more mindful when approaching a new project!